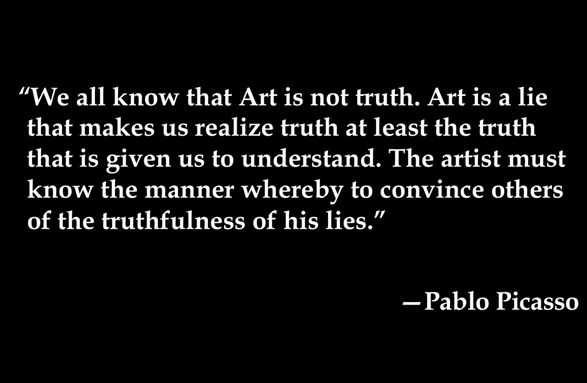 Recently I watched the Ted Talk by children’s author Mac Barnett published on June 19, 2014 called ‘How kids can teach adults to read.’ He explores the relationship between fiction and reality and as a child he loved the quote by Picasso. 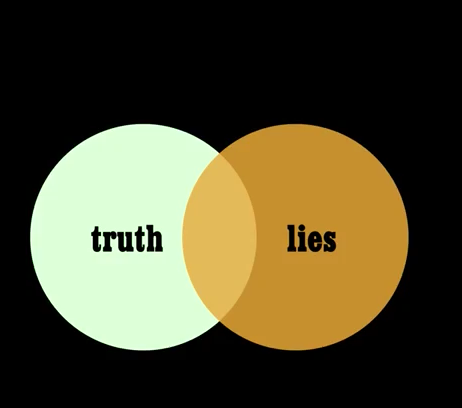 Mac Barnett drew the Venn diagram below and explained that for him the overlap between truth and lies is what he calls the art. I have often chuckled at the thought of “us writers” creating characters and we talk about them as though they are real people. Truthfully, in my writer’s imagination my characters are real and have a real family and a life history. Put to paper, the characters can then come alive in every reader’s mind. That’s the magic of storytelling. And when any author’s book is made into a movie their characters can become even more “real” through the actors. I must be in a bit of a philosophical or maybe a scientific mindset at the moment, but really, what is reality? Are our thoughts “real?” In the physical scientific sense how can we even measure a thought? And if we agree that thoughts are real, then is everything we think of also real? Why do any of us think about famous characters such as Sherlock Holmes, Jane Austin, Jack Reacher, etc. as “real?” Or even fantasy characters such as Peter Pan or Whinnie the Pooh, even though we know they aren’t? It really is all in our heads. Then Mac Barnett said it in plain words and brought home to me yet again what everyone in our writing group has learned and talked about. That’s what we as writers are striving to achieve. That’s what Queen Scheherazade of 1001 Nights (a.k.a. The Arabian Nights) that Helga talked about in her last post achieved in her storytelling to her husband, the Persian King Shahryar each and every night for almost three years. It literally saved her life. And that’s what all those debut authors did that made the bestseller’s list that Silk referred to this week. All these storytellers made their listeners or readers have real feelings about their fictional characters. Understanding that and then achieving it is the real magic in fiction writing, don’t you think? This entry was posted in Characters and tagged character development, emotions, writer's journey by Karalee Greer. Bookmark the permalink.